Sourdough bread can be baked in a conventional oven, but it shines in a Dutch oven outdoors! 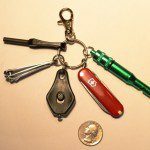 Buy a keychain survival kit! 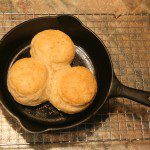 When I started competing in Dutch oven cookoffs about eleven years ago, bread was my weak dish. Every International Dutch Oven Society sanctioned cookoff requires three entries; a main dish, bread and a dessert. I decided that the best idea was to find a good traditional sourdough dinner roll recipe, practice it, and tweak it to my personal preferences. I also worked with the same camp oven. I finally standardized on an 8-inch Lodge cast iron. There were several reasons for this: It was small enough to move easily, and light enough I could pick it up to do some precision browning. The oven was also just the right size to feed my family of five. By the time I got done practicing, this recipe was a good as I could make it. One judge at the 2004 IDOS championships commented “Best sourdough flavor here!” on our evaluation sheet. Like anything, practice makes perfect. Before I retired it from competition, this recipe had won over $500 in prize money and assorted swag in several different Dutch oven cookoffs. Check it out – this recipe has been very good to me! 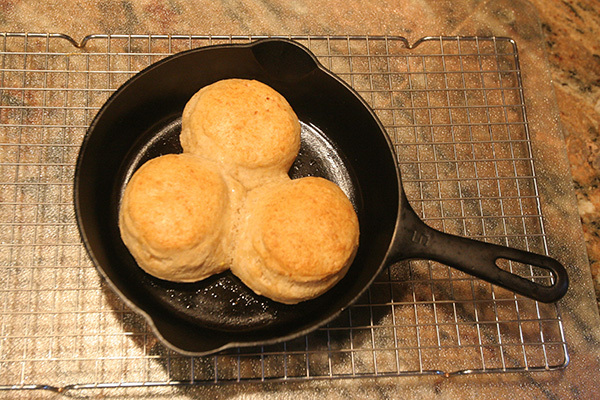 Form the dough into a loaf or rolls; place in 8-inch or 10-inch Lodge shallow camp oven. Brush the tops of the rolls with the egg and water mixture. This will make the top brown. Check Out Our Affiliate Blogs!